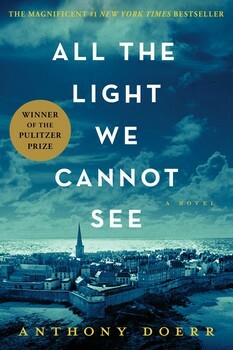 All The Light We Cannot See is one of the most beautiful novels I’ve ever read about WWII. Doerr has an amazing knack of capturing morality and humanity and holding it in his palms while things play out. You can tell that he meticulously researched this novel and yet it’s so incredibly readable. The chapters are short and oscillate between the two main characters, Marie-Laure and Werner. The oscillating keeps the story in constant motion and keeps the reader on their toes. Through the flashbacks and switching of years and characters, the story begins to emerge in starts and stops. You get to see the growth and stagnation of certain characters and the impact they have on this story. Both brutal and beautiful, All The Light We Cannot See made me think, wonder, and cry. I became so attached to the characters I couldn’t put the book down. I had to know how the story was going to play out and how the two main characters lives were going to interconnect. At first I thought the characters were going down one specific path but, as it turned out, I was wrong. Their certain paths seem almost predetermined but Doerr throws in some surprises. Werner, the mechanical genius with the need to belong, fights his basic nature to be part of the Hitler youth movement until a major event shocks him back to himself. Marie-Laure, a young Parisian girl who has lost her sight, relies exclusively on her father until he is turned in by a neighbor and arrested. Then Marie-Laure must figure out how to navigate life without him. When these two incredible people connect it’s wondrous. The scenes still bring tears to my eyes as I type this. This review can’t be complete without mention of the Sea of Flames, the diamond that perhaps caused all the ruckus? I loved how Doerr toyed with the idea of fate and our perceptions of objects and how that perception can change worlds. This diamond is said to be cursed. Anyone who holds it will live forever but the people around him will perish. “That something so small could be so beautiful. Worth so much. Only the strongest people can turn away from feelings like that.” Men fight wars over this diamond and this diamond is the glue of this story. Rating: 5/5 Please go out and find a copy of this novel.